Basically, you use Vanishing Point to set the edges of the visual elements inside your photos. Then, let Photoshop auto-magically export the photo in a format AE can open as a 3D object. Then, set up your AE cameras to move through the 3D environment to your heart’s content. 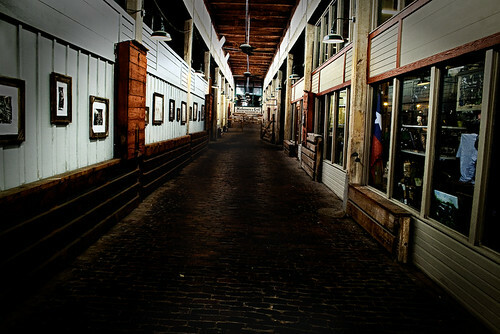 I slapped together a quick test using a photo I had on hand of the Ft. Worth Stockyards. In the clip below, I first show you the photo, then the 3D version. Even my novice effort landed some promising results. Since photography is my first love, you can bet I’ll be working this tool into future video projects! Vanishing Point will work best on images with flat planes — like buildings, landscapes, and roadways. Rather than me try to confuse you with a walk through, here’s a very good tutorial from Video Copilot to get you started. Vanishing Point is a simple way to make 2D…disappear. This entry was posted in media, photography, reviews, video. Tagged after effects, photography, photoshop, point, post production, review, tips, tools & tips, tutorial, vanishing, video. Next Post Next post: You wanna fight? Excellent effect. Can’t wait to incorporate that technique into something. Yeah, I don’t know how we’ll use it. But when we do, we’ll look like geniuses!